Girl just wants to have fun! Preps for Dr. Vicki Belo and Hayden Kho's church wedding are definitely in full swing! 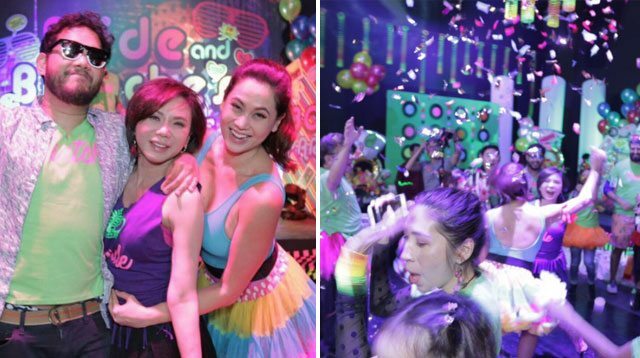 Vicki's children, Quark and Cristalle (from her previous marriage to Atom Henares), planned the traditional farewell-to-singlehood party for their mom. Director Quark and Cristalle spared no detail for the intimate affair at The Studio Ultra Lounge—from unisex neon shirts that read "biatches" to tulle tutus (also unisex), and lots of confetti! Tim Yap, Tessa Prieto-Valdes, and Phoemela Baranda were among those who attended. The crowd went wild when Cristalle and Vicki's close friends gave a surprise dance number to Cyndi Lauper's '80s hit "Girls Just Want To Have Fun." In an Instagram post, Vicki thanked her daughter, son, and friends for organizing "a fun, 'tried-to-be' wholesome bachelorette party." Vicki and Hayden will be holding their church nuptials in Paris, France in less than a month.